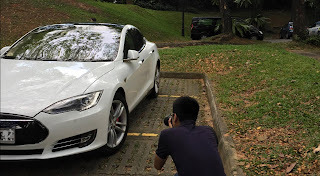 Yesterday, Singaporean Transport Minister Khwan Boon Wan confirmed The Model 3 would be entitled to the maximum rebate of SGD$30,000 (or US$22,000) under the current Carbon Emissions Vehicle Scheme (CEVS) - which incentives car owners to buy environmentally friendly cars - if it is assessed to be as energy efficient as the new Model S. However importers will have to submit its electrical energy consumption information for the Land Transport Authority (LTA) to assess if it should attract a rebate or a surcharge. It is still unknown how much the Model 3 will cost in Singapore. all imported vehicles in Singapore are heavily taxed considering how small the island is. In a recent interview to CCTV, Tesla President of Global Sales & Service hinted: "We are looking for additional factories so that very well maybe in China". 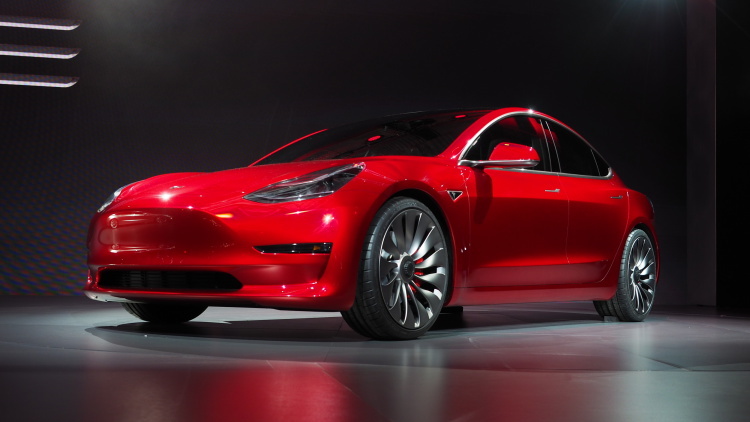 Back in February, Elon Musk met with Singaporean PM Lee Hsien Loong during his visit to the United States where he gave PM Lee a "brief but exhilarating ride in the Tesla Model S P90D". Weeks after that, an imported second hand Model S to Singapore made the headlines when its owner Joe Nguyen was taxed with a carbon surcharge of SDG15,000 (or US$11,000) instead of being awarded that amount under the CEVS Scheme. LTA tested the Model S for its fuel efficiency and decided to use the United Nations Economic Commission for Europe (UNECE) R101 standards to calculate Model S' energy consumption and assess its carbon emissions produced from electricity generation. Back then, LTA spokesperson responded: "As for all electric vehicles, a grid emission factor of 0.5 g CO2/Wh was also applied to the electric energy consumption. This is to account for CO2 emissions during the electricity generation process, even if there are no tail-pipe emissions. The equivalent CO2 emission of Mr Nguyen’s car was 222g/km, which is in the CEVS surcharge band". Under the revised CEVS, Mr Nguyen's Model S falls in the C3 band, which accounts for cars with 216 to 230 g/km, and carries with it a SGD$15,000 surcharge. 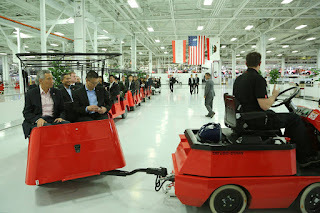 She added that the Model S is not the first fully electric car where grid emission factor was applied. 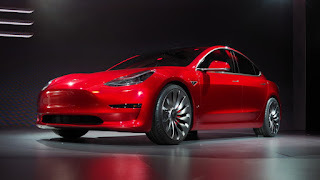 A Peugeot Ion, for instance, was registered in July 2014 and received the maximum CEVS rebates, however "This is the first time a Tesla Model S has been tested for emissions" the spokesperson said. Last year, a Singaporean EV workshop imported two Model S but admitted that LTA made the process so difficult that after sitting in the workshop for over 6 months, they shipped them back out. 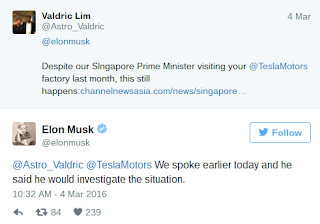 Few hours after the news of Joe's Model S broke out, Elon Musk tweeted he had spoken to PM Lee, and "he said he would investigate the situation". A spokesman for the Prime Minister's Office confirmed the conversation took place, and said various agencies were looking into it but speculated it was too early to say how things would pan out. However on March 10 2016, LTA issued a statement agreeing to re-test the used Model S of Joe, as is the policy for the import of all used cars, claiming it would not know how much the car’s condition might have deteriorated. As of this month, the newly tested Model S will be entitled to the CEVS scheme of SDG15,000 (US$11,000). 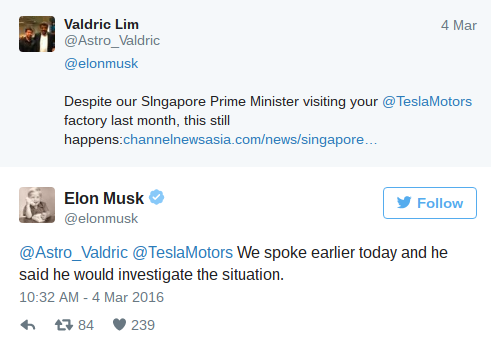 Elon Musk announced on March 31 2016 that Tesla will expand the Model 3 order to at least 7 new countries including Singapore. Yesterday, Transport Minister Khaw Boon Wan pointed out that even though electric cars do not produce tailpipe emissions, the process of generating the electricity used emits carbon: "The greenest form of transport is public transport. So do follow me - if you cannot be a 100 per cent public transport user, at least be a part-time public transport user." He added that the Transport Ministry would also look at adopting electric vehicles for public transport, as it urges commuters to move towards a car-lite Singapore. Recently Mr. Wan announced a scheme to install 2,000 charging points for an island-wide electric car-sharing program but gave no indication on when it will be launched. There are currently around 100 charging points in commercial, public and residential buildings but only half are in operation. According to LTA, around 120 electric and plug-in hybrid vehicles are circulation on the island.